Cattle Decapitation performed at the Oakland Metro Operahouse in Oakland, CA with their brothers in Krisiun and Suffocation on November 4th. CATTLE DECAPITATION kicked off a month-long North American tour in October supporting Suffocation. The journey runs from October 21st through November 17th. Additional support is being provided by Krisiun and recent additions, Visceral Disgorge. See remaining dates below. American death/black metallers with a Swedish touch, CAST THE STONE, premiere the first single “As The Dead Lie”, taken from their recently announced six-track EP “Empyrean Atrophy”, which is due for release on Agonia Records on August 31st. The track comes with a lyric video designed by Scott Rudd Film (Opeth, Rings Of Saturn). Watch the lyric video below. CATTLE DECAPITATION will headline the MetalSucks and Exclaim! 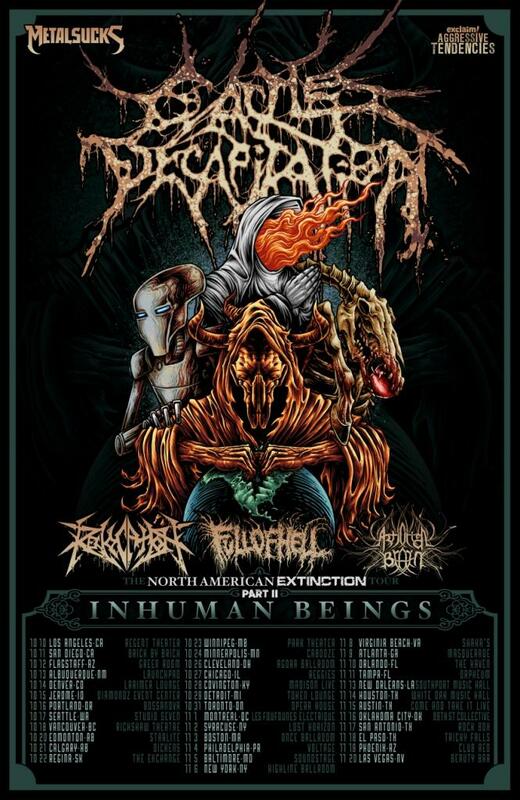 Aggressive Tendencies Presents: The North American Extinction Tour Part II: Inhuman Beings, featuring Revocation, Full Of Hell, and Artificial Brain as support. The journey begins October 10th in Los Angeles, California and will run through November 21st in San Francisco, California. Tijuana, Mexico’s mad doctors of gore, Thanatology, replace Full Of Hell as support on the first three dates. See below for all confirmed shows. CATTLE DECAPITATION will be touring in support of their most recent full-length, 2015’s The Anthropocene Extinction. With no room left in hell, Chicago’s Broken Hope will be heading back to UK shores this September as part of the bone-crushing deathgrind HELL ON EARTH TOUR 2017 package. The band will be joined by young guns Gloryhole Guillotine, Italian tech-heads Hideous Divinity and the grindin’ headliner, Cattle Decapitation. Further dates for the trek are pending. The tour is in support of the band’s latest twelve track slasher, Mutilated And Assimilated, which was released on June 23rd via Century Media Records. dates. See below for all confirmed shows. 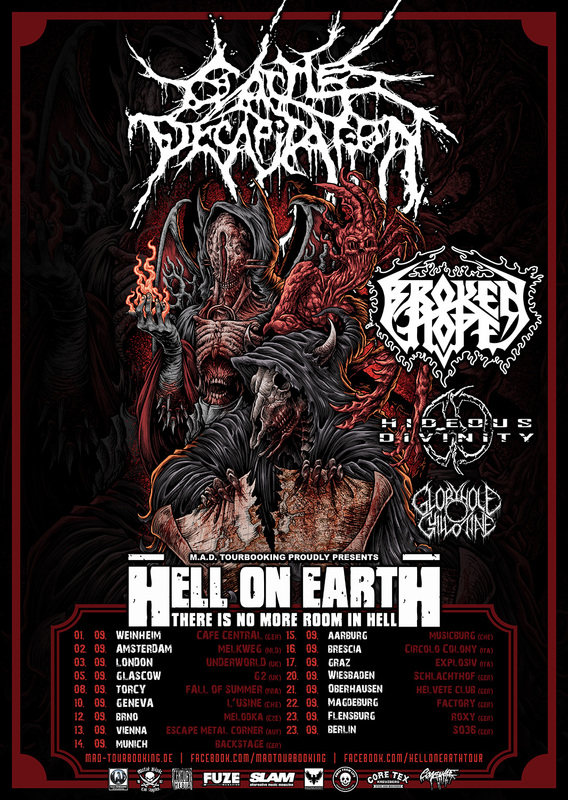 New Orleans’ Goatwhore is currently on the road with label-mates Whitechapel, Cattle Decapitation, Allegaeon, and Necromancing The Stone for a special trek that celebrates Metal Blade Records’ 35th anniversary – with added headlining dates scattered throughout. Following these shows, the band will take a short break before joining Amon Amarth for two weeks’ worth of dates from May 1st to May 21st. Due to scheduling conflicts between the two tours, Goatwhore will not appear on six of the Metal Blade Records’ 35th Anniversary Tour stops. See below for all dates. Goatwhore recently completed tracking the follow-up to their acclaimed Constricting Rage Of The Merciless full-length. Titled Vengeful Ascension, the band’s latest studio offering was captured at Earth Analog near Champaign, Illinois. Fans will be able to pre-order Vengeful Ascension as part of an exclusive bundle only available directly from the band’s merch booth on both tours. The bundle will come with a t-shirt and laminate exclusive to this pre-order bundle only. The laminate will contain a special code to input online to have the physical copy of the album ship when released.